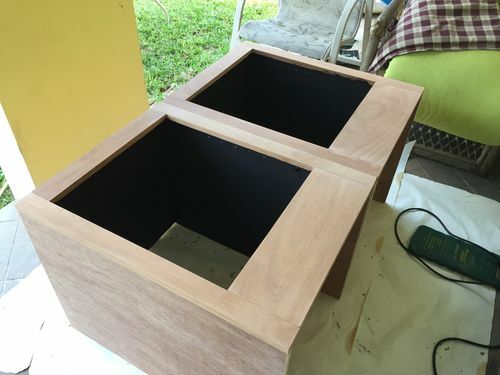 Cabinet/Bookshelves #3: Can it be? I'm actually back on this project? Well it’s been almost two years since I stopped work on this project. A number of things combined to get in the way, not the least of which was a sale of the property where my workshop was. This really threw me for a loop, as for well over six months I had no workshop facility at all, until I finally built a vinyl 10’ X 15’ shed (see build blog elsewhere on this site). Then there was a pergola to build and multiple chicken coops (also on this site), and now at long last I’m back on track. Any wonder why this project has taken over six years??? Anyway, this weekend I used a pony clamp to screw the two face frames together and bolted the two base units together. Once together, I gave them a good sanding, and then stained the insides of the base units. 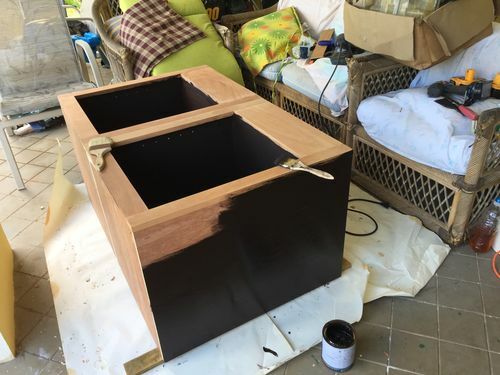 Because the units are mahogany, I have chosen a very dark stain called Java, which looks like the commercially applied stain used in mahogany furniture. In the pictures it appears black. I will likely tackle the doors next. Planning on doing rail and stile, tongue and groove doors. Hopefully pics of that progress next week. Good to see you are up and into it again. Now with all of the number of things getting in the way the hurricane didn’t rate a mention? The cabinet is progressing well !!. Yeah that ol’ hurricane was just one more distraction, in that I needed to repair the workshop! But hopefully now I can make steady progress. Thanks for checkin’ in on me!